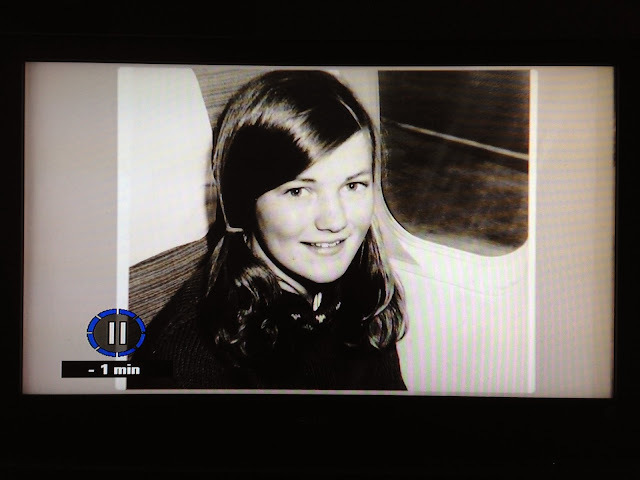 It's kind of disturbing, to see your fourteen year-old face flash up on the TV screen at random times throughout an evening's viewing - like being a former child star, maybe, when you're now a faded celebrity. Think Macaulay Culkin! But that's what happens, when you respond to a Twitter request for old photos to help celebrate Air New Zealand's 75th birthday. I sent this one in, a professional one with deckle edges, that was taken on my very first aeroplane experience, and they've used it in their retrospective ad. Air NZ had, I think, a new plane, and were offering scenic flights over the Southern Alps, and my father shouted my older sister and me a joyride that lasted about an hour, all up. It was quite an occasion: I remember she was all dressed up, while I wore my old favourite hand-knitted blue jersey (which I've never been able to throw away and is still at the bottom of my drawer). It was thrilling to experience all that for the first time - and I've been a window person ever since - but if I'd known then that that was the just the first of what must be now hundreds of flights with a score or more different airlines all over the world, I would have popped with excitement. I'm happy to be part of Air NZ's advertising: after a trip away, stepping aboard is always like coming home; and even just seeing the koru at an overseas airport will give me a warm and comforting glow. I don't think I'm alone in feeling connected to the airline in a way that I really doubt anyone does with British Airways, for example, or United. Qantas, maybe, though, for the Aussies (poor things). And, just to underline the coincidence theme* that runs through these posts, I also appeared on TV recently in my 2015 incarnation, in the coverage of the Chunuk Bair service on Anzac Day. Please note how I'm almost the only one in the frame who is paying attention to the reading that Prince Harry is doing, instead of peering off to the side to see myself on the big screen. Pretty much just me, the hipster guy, tragic man and the girl who actually looks much more like Air NZ me than I do now. * Also, Prince Harry is in NZ right now. We get about, he and I.